Feed. Educate. Employ. These have been the pillars of our mission in Haiti since the inception of Help for Haiti in 2010. All three of these pillars are critical to the growth and development of the children of Haiti, but we believe that feeding the children is the single most important resource we are able to provide. Chronic malnutrition runs rampant in Haiti, and children simply have no capacity to grow – physically or mentally – without daily nourishment. Over the last seven years, we have shipped over 1.3 million meals to Haiti at a cost of no less than $293,000. Just last month, we safely delivered a shipment of 250,000 meals, which will feed over 500 children for the entire 2018-2019 school year. This is a feat to be celebrated! Florida, as a fundraiser to displace some of the cost of these meals. The Ride was a great success, and our team of four riders brought in nearly $41,000! 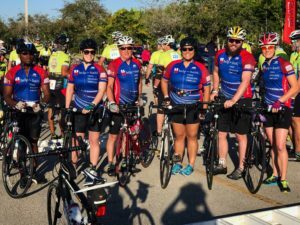 Ultimately, the ride was so successful that it spun off into its own entity, the Pan-Florida Challenge for Hungry Kids, and we shifted its mission to ending hunger in the state of Florida. It has gone on to be a big success and is feeding thousands of hungry kids in the interior of south Florida. 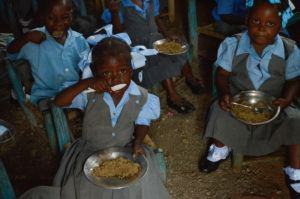 In 2016, Help for Haiti entered into a deeper partnership with Feed My Starving Children, allowing us to further supplement donor support to feed more children than ever before without accruing more overhead costs. Feed My Starving Children donates 250,000 Manna Pack meals to Help for Haiti, and our responsibility is to get them to our kids in Haiti. This has resulted in a shifting of our resources, which prompted us to say goodbye to our beloved Annual Mobile Food Pack, at least for now. And now, this brings us back to present day. Eight years later, we are still feeding over 500 children so that they are strong enough to receive an education and prepare for adulthood in the poorest country in the Western Hemisphere. 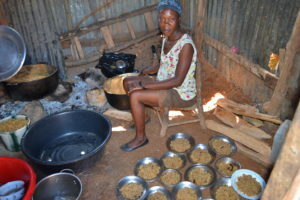 For the next year, and many after that, these children will return to school every fall and rest assured that they will receive a hot meal every day of the upcoming school year. 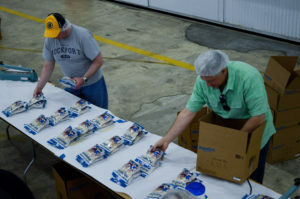 So allow us to say thank-you, to Feed My Starving Children, to our generous community in New Hampshire, and to our donors and supporters in New Hampshire, Florida and everywhere in between who have made it their personal missions to help us achieve ours.